My name is Natasha Maxwell and I am thrilled to welcome you to That Girl. I am a visionary, entrepreneur and advocate for all things SHE led. I have built businesses, raised my family and worked alongside some of the most inspirational women in the world and I am so excited to have you here. In this space we're going to talk all things ambition. My #ThatGirl brand is all about strong female leadership and I wear what I preach! Have you seen the red lipstick cute T-shirts?! From an early age (I was an 8 year old DIVA) to present day I have been working for my dreams. I don't allow anything to hold me back and neither should you. You can read all about my journey to becoming That Girl here and if you want to ask me any questions drop into The Community and lets connect! So fire up your engines ladies, we're heading straight to the top! My team and I recently introduced 4-part event series titled “Stand In Your Purpose”. I am so excited to bring you the lowdown on the event and give you the opportunity to learn more, no matter your location in the world. I found it hilarious that I planned this event for women who are 40 and over. I received so many complaints I had to open it up to women aged 21 and over! The ladies in the room hugged, laughed, cried and shared many insecurities, truths and joys together. Our mentors, rather our speakers, we’re all down to earth, having over 150 years collectively of success, empowerment, spirituality, and the ability to ignite change in people. We cannot wait until the next session of Stand in Your Purpose-Cultivation Session! Head over to www.iam-thatgirl.com to check out the video of the event in our Being That Girl Blog. How often do you celebrate your fellow woman's success? How do you decide to celebrate the success of other women? In what way do you demonstrate support of another woman's success? Often times when we use or define the word SUCCESS, we only associate the term with accomplishing a professional or business pursuit. However, SUCCESS is simply defined as the accomplishment of an aim or purpose. What's our fellow woman's aim or purpose? Usually, we're surrounded by women who are diverse in their purpose. For example, my closest friends pursue motherhood, spiritual, professional, educational and entrepreneurial goals. Regardless of their aim, I personally feel compelled to support and celebrate every step leading to their WIN. But how often do we celebrate the wins of women who are not our closet friends and family, and to what extent? Delores Stark was known as 'That Girl' through out my entire life. My mother would say "I'm that girl" whenever she felt or looked amazing. Her family, friends and even her grandchildren knew her as being That Girl. 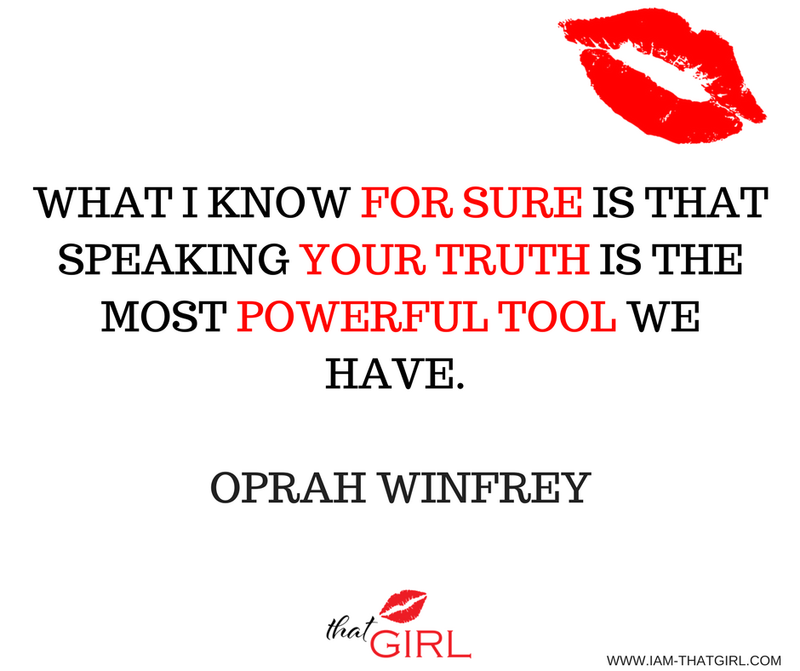 Use your tools, and Speak your Truth! Let's Celebrate and Support One Another!